A grandson of famed mathematician and scientist Satyendra Nath Bose, who prompted Albert Einstein's 1924 prediction of Bose-Einstein condensate, met with the Nobel Prize-winning physicists who created the condensate on July 11. 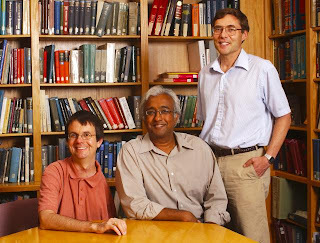 Falguni Sarkar, 40, of San Francisco (center) met with Carl Wieman (right) and Eric Cornell (left) at JILA, a joint institute located on the CU Boulder campus of the University of Colorado at Boulder and the National Institute of Standards and Technology. Sarkar is writing about his grandfather. Wieman is a distinguished professor in the CU-Boulder department of physics and Cornell is a senior scientist at NIST and an adjoint professor of physics at CU Boulder. The two JILA fellows led a team of physicists that created the condensate, a new form of matter, at just billionths of a degree above absolute zero on June 5, 1995. Next I'd like to meet Wolfgang Ketterle of MIT. Of the three, he's the one who continues to do work in the area of BEC.